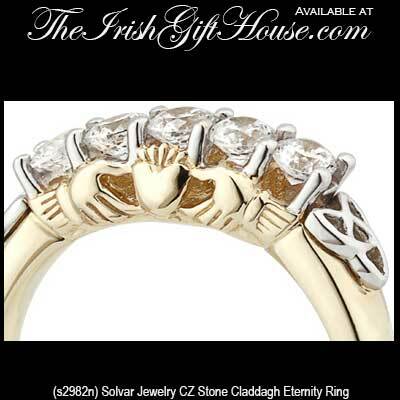 Gold Claddagh rings are known for the endearing Irish symbolism of friendship, loyalty and love. These women's Claddagh rings are a lasting testament to your Irish heritage. These women's Claddagh rings are offered in various gold caret weights and styles and some of the smaller women's gold Claddagh rings on this page are suitable for babies and children. 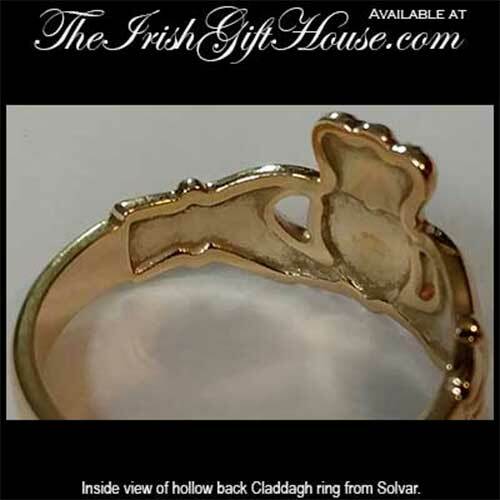 The Irish Gift House features traditional gold Claddagh rings for women and additionally we have a large assortment of with stone settings in the heart or as accents. We also offer Celtic Claddagh rings with Celtic knot accents. The 16th century Irish legend tells us the birthplace of the Claddagh ring was the fishing village of Claddagh in Co. Galway Ireland. Our Irish jewelers have practiced the skill of Richard Joyce, the creator of the first Claddagh ring, and The Irish Gift House is proud to offer this grand selection to you. All the Claddagh rings from The Irish Gift House are made in Ireland and are hall marked by the Irish Assay Office at Dublin Castle and are presented in a gift box with the Claddagh Legend and the Galway Folklore. 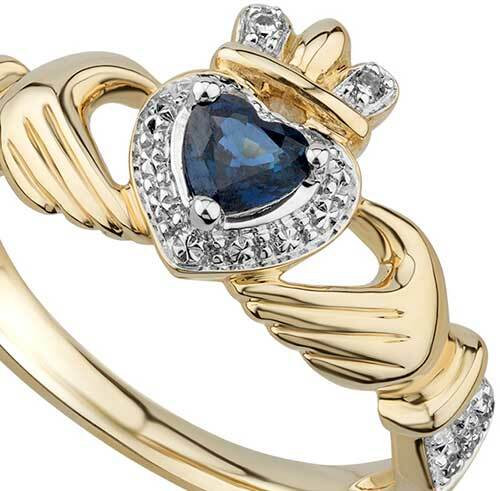 Gold Claddagh ring features a genuine sapphire heart along with diamond accenting. 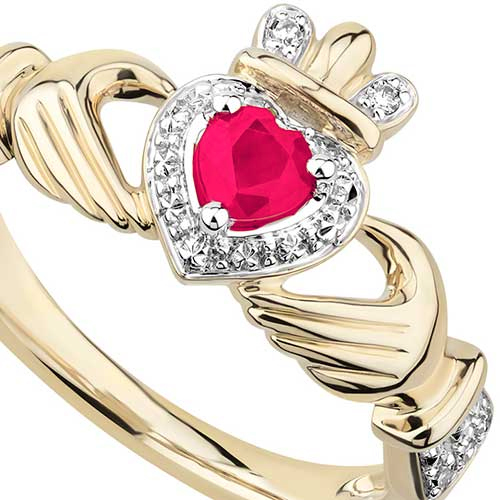 Gold Claddagh ring features a genuine ruby heart along with diamond accenting. 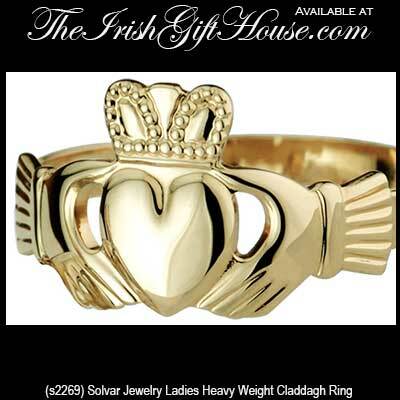 This heavy weight gold Claddagh ring for a women features a puffed heart. 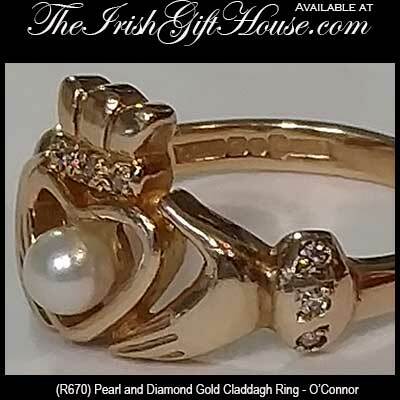 This gold Claddagh ring for women features a freshwater pearl heart along with diamond accenting. This women's gold Claddagh ring features a puffed heart. This heavy weight Claddagh ring for women is crafted in 10K gold. This pearl heart Claddagh ring for women is cast in 10K gold and features diamond accents. 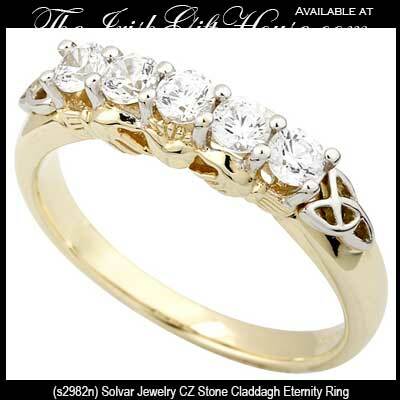 This gold Claddagh eternity ring features Celtic Trinity knots. This 14K gold Claddagh ring features a smaller design with a heavy weight and a puffed heart. This 10K gold Claddagh ring with a puffed heart is an ideal design for women. This 10K gold Claddagh ring is crafted in a classic style. This gold Claddagh ring for women features a garnet heart. This gold Claddagh ring features a green agate heart. 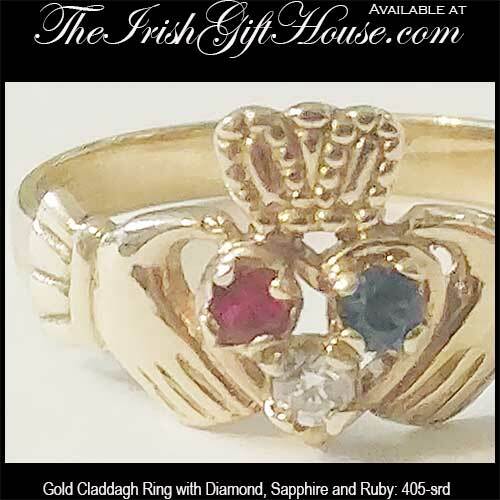 This gold Claddagh ring features a ruby, diamond and sapphire heart. This women's gold Claddagh ring features a green agate heart. This Claddagh ring is cast in 10K gold and it features CZ stones. This gold Claddagh ring for women is unique in that it features the iconic Irish symbol repeated six times. This light weight Claddagh ring for women is cast in 10K gold. This lightweight Claddagh ring is crafted in 14K yellow gold. This small 14K gold Claddagh ring features a puffed heart along with a hallow back. This light weight gold Claddagh ring for women features a narrow twist band. Now that you have found the Irish ring of your dreams you will want to accessorize. Enhance your selection with a pair of gold Claddagh earrings; you may select from stud, drop and hoop styles and from various colors and caret weights. Naturally we also feature gold Claddagh necklaces and bracelets so you will be able to create a complete set of matching Irish jewelry. We are sure that you noticed the assortment on this page is for women, but we also have a complete collection of men's Claddagh rings that are available in either silver or gold. You may want to note that we have similar women's Irish jewelry within this section that includes diamond Claddagh rings and white gold Claddagh rings. If you can't find what you are searching for please give us a call, we will be happy to assist. 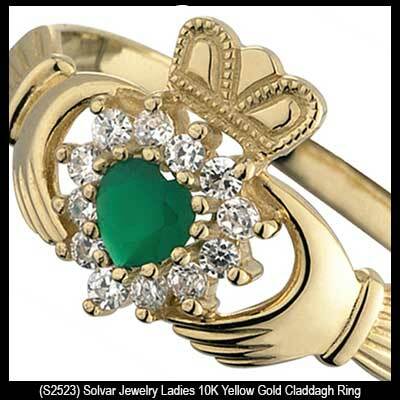 This collection of women's gold rings are made in Ireland by Solvar, TJH and O'Connor Jewelry.